My dear ladies and occasional gentleman, this week I have only been venturing out in DARK GLASSES. Well it has been SUNNY I hear you say and you would be right! That however is not the reason I am wearing SUNGLASSES and only going out after DARK. I have turned into a MINION! I HAVE ONE RED-EYE and not in a PHOTOGRAPH! It was a present from WALES, I think I would have rather had a STICK OF ROCK. The timing is perfect I am going to a WEDDING next week! If any of you have an EYE-PATCH for OCCASION WEAR, please please may I borrow it? SOMETHING FISHY IN THE LADYGARDEN! SOMETHING FISHY IN THE LADYGARDEN! Yes my dear ladies and occasional gentleman I must confess to there being something fishy in the LADYGARDEN. But WHERE was it and more importantly WHAT was it? I first noticed it in the kitchen and after following the SCENT like a BLOODHOUND, I realised I had to VENTURE further. Into the UTILITY room. It had a distinctly FISHY AROMA which stopped me DEAD! Was I FOLLOWING the SCENT or was the SCENT FOLLOWING me? Oh the RELIEF when I spotted the CULPRITS. Oh the things you do for your GRANDCHILDREN. These CACOTOPIA CANCRIFORMS have been removed from the premises! My dear ladies and occasional gentleman, I fear Ronald is a little PREVIOUS. Since our return from BEAUTIFUL WELSH WALES to the EQUALLY BEAUTIFUL DEVON he has held a VIGIL. Not a great FRUIT lover, being more of a VEGETABLE man I have had to work hard to convince him of the MERITS of GROWING our own FRUIT. 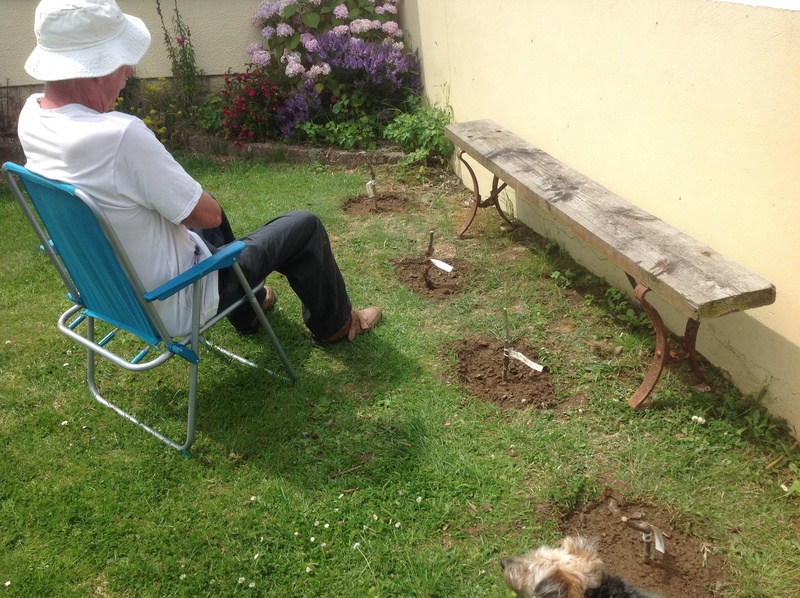 Having given in and PLANTED the STICKS, he now SITS and awaits the FIRST FRUIT! GETTING TO GRIPS WITH SEAMEN. 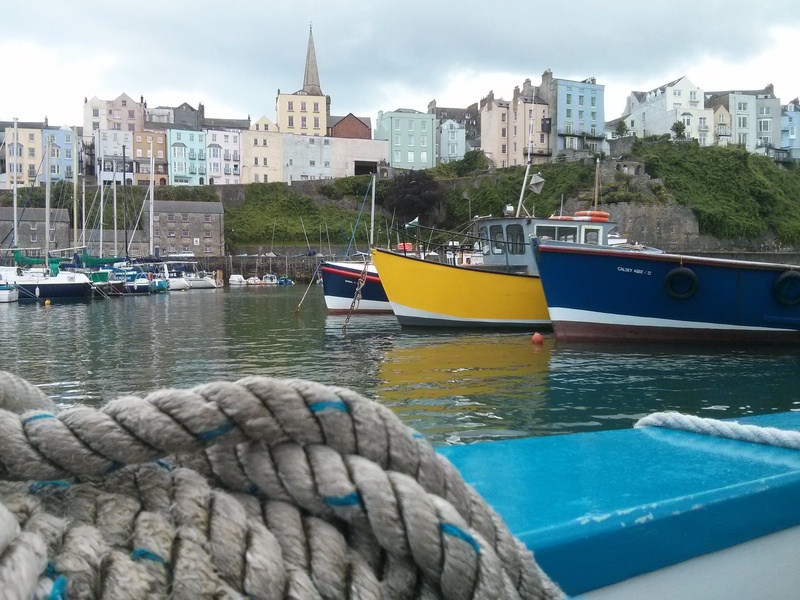 My dear ladies and occasional gentleman, one of the HIGHLIGHTS of our WELSH adventure was a BOAT TRIP to CALDEY ISLAND. 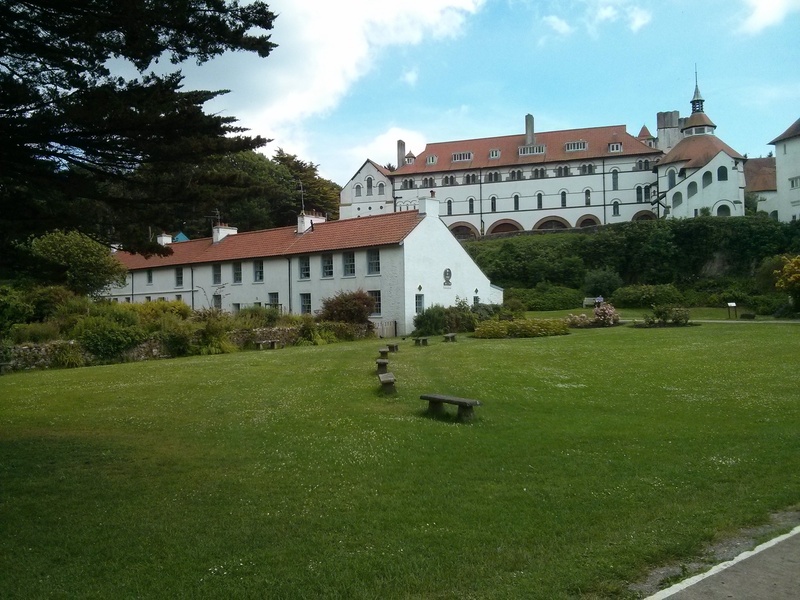 The island is home to CISTERCIAN MONKS who delightfully make PERFUME & CHOCOLATE. What more could a LADY want. 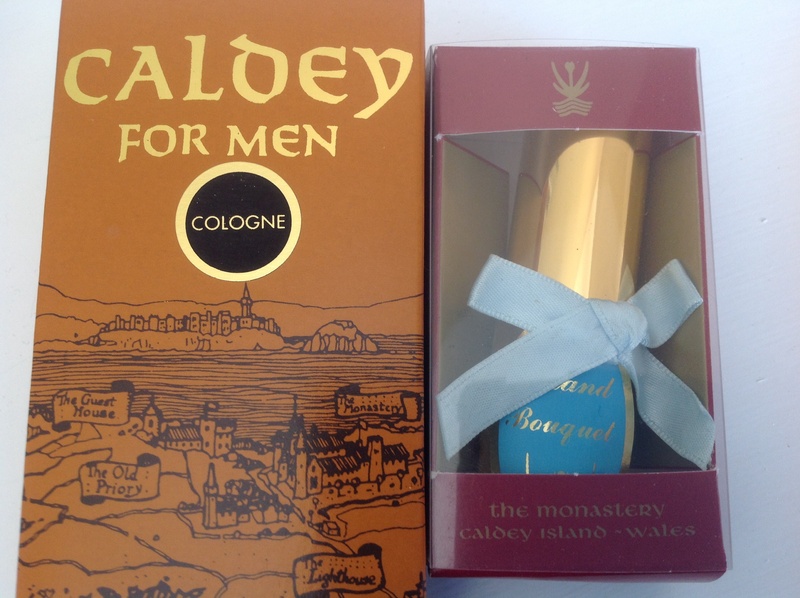 Or a gentleman, Ronald was rather taken with ‘CALDEY FOR ,MEN’ I’m only hoping he doesn’t take to wearing a WHITE ROBE and SHAVING the top of his head! The boat trip was great FUN especially getting IN and OUT with SEAMEN, what a SALTY FIRM GRIP! BEING HAUNTED BY THE WELSH! I AM BEING HAUNTED BY THE WELSH ACH-A-FI! Having returned from a SOJOURN in WELSH WALES, for the past TWO DAYS all I can hear in my head are WELSH ACCENTS! And if I’m not careful, I find I’m speaking like it myself POPTY PING!